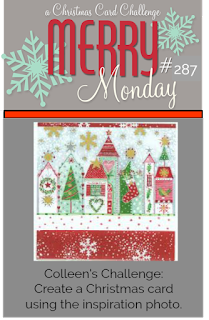 After starting and stopping all week I have finally managed to complete a card.....and I have time to write the post before I go to bed and the linky closes :) I loved the inspiration photo for this weeks Merry Monday Challenge, so many possibilities and great colours. I had a few ideas, but in the end only managed to get one card done. 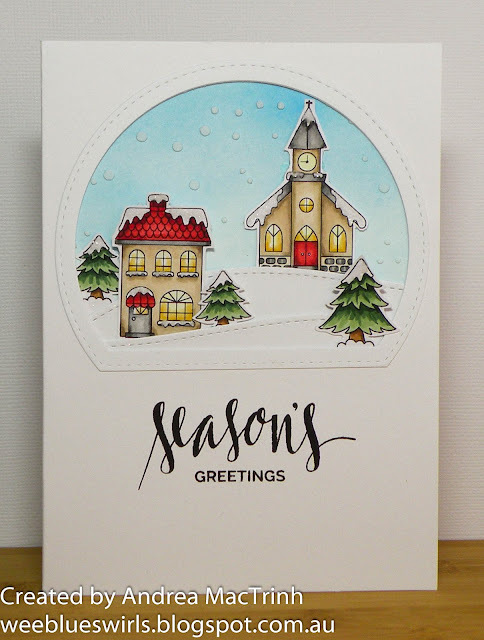 The buildings and the trees are from a digital stamp set called Winter Village from Craftin Desert Diva's. What I love most about digi's is the fact you can resize them for your project, which I did here, making them smaller. I coloured them in with copics and added rock candy to the snowy areas and fuzzy cut them out. For the background I sponged some distress ink onto white cardstock and then applied the embossing paste, and then diecut the snow hills, and layered everything together. From this photo it is very hard to see the dimenson. I will take some more photos tomorrow in the daylight which will hopefully show this better. I diecut the arch window directly out of the card front and then created the frame around it by using the two largest dies in the stax. The scene was then placed behind this. The sentiment was stamped directly onto the card base. Thanks so much for popping by and taking a look. I hope you had/are having a great weekend. Beautiful card. Your coloring is fabulous. I love how you framed the scene with the cute house, church, trees, and the snow hills. Great design. Thanks so much for sharing with us at Merry Monday. This card is awesome, I love the shape of your scene and the house and church are adorable! So glad you got it entered in time to join Merry Monday! Ooooohhhh - I love the little scene you created with all those MFT goodies! Thanks for playing along with us at Merry Monday. This is wonderful, Andrea. I love the scene you've created and colored so beautifully. It looks great in that stitched arch. Thanks so much for joining us at Happy Little Stampers April Christmas Challenge. Such a pretty card, love the beautiful scene you have created.